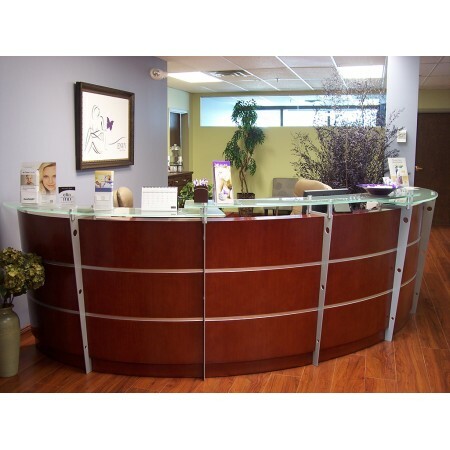 This beautiful genuine cherry reception desk is a stunning combination of wood and glass. 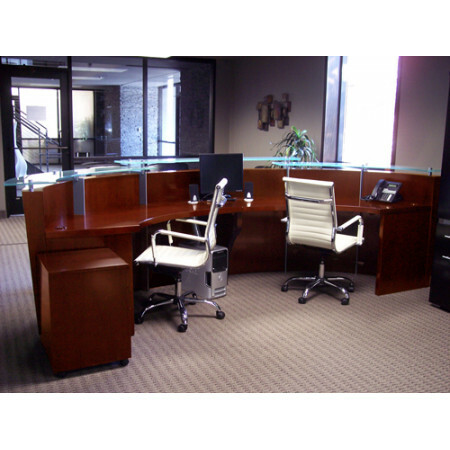 Its' impressive design sets the professional tone you desire for your corporate entry/reception area. Furniture of this style and quality could only be achieved by skilled hand-craftsmanship. 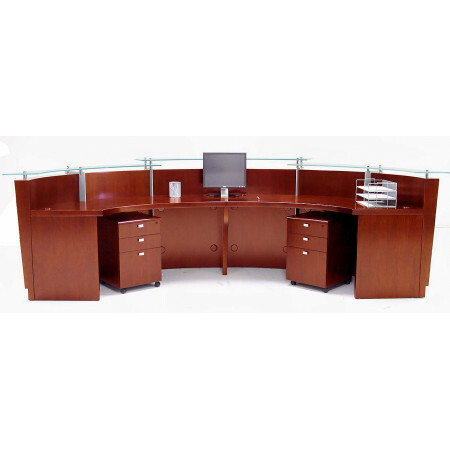 The overall space required at the counter height of this desk is 142-1/4" by 51". The desk footprint measures 129-1/2" x 47-1/2". Frosted, tempered glass radius counters are 1/2" thick and appear to float above the wood surface on chrome posts. The overall height of the side counters is 41-1/4". The center glass counter is 43-1/4" high. The 2" thick slab work surface has a working height of 29-3/4" high and working depth of 23-1/4". Four cable grommets in desktop allow for easy cable management. Tapered solid wood slab front panels are a full 4-3/4" thick at the top counter surface. Silver accent panels are 3/16" thick and a full 11" deep at the top. Glass counters are 11-3/4"D.